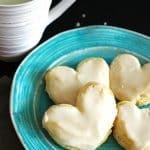 These delicious Puff Pastry Dessert made in the shape of a heart are perfect to make for Valentine’s Day or any day for someone special. They are rich in flavor and so soft they just about melt in your mouth! These make a lovely dessert for any day but would also be something special to make for Valentine’s Day, Mother’s Day or Father’s Day. Not only are they delicious, they are easy to make. These are great for kids to help out with as well! One of the great things about this recipe is that it is kid friendly so your kids can help out making these. One of the reasons they would be fantastic for Mother’s or Father’s day! It is fun to bake with kids…might be a bit more of a mess to clean up, but it is fun to bake together. And of course they make the best taste testers! These can be made plain or with a little cinnamon and sugar mix added to them. They are a hit at my house either way. They are delicious just with the frosting, but I also like the cinnamon addition to add a little zing to them. I will share with you how to make them both ways. Maybe try them both and let me know which one you prefer?! 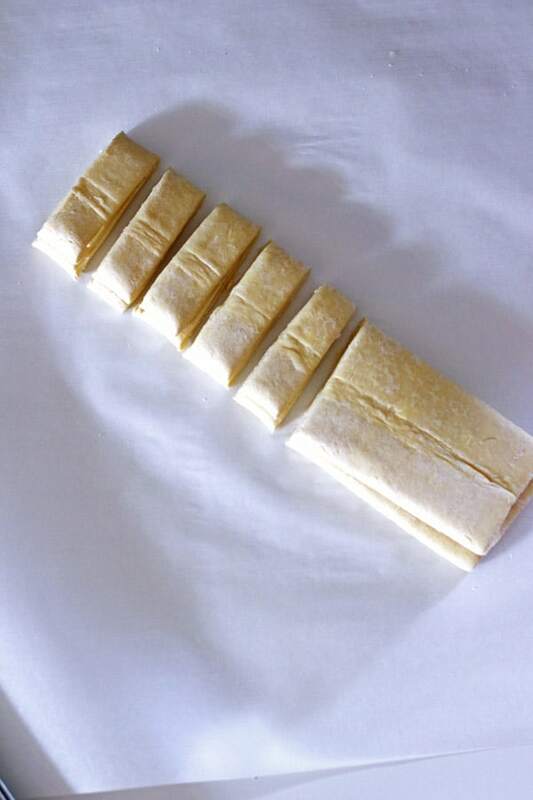 Thaw the pastry dough by taking them out of the box and packaging and placing it at room temperature for no longer than 40 minutes or until it unfolds easily. The pastry sheets should still be cold. I like to bake one sheet at a time so I take one pastry sheet out to defrost at room temperature and then while I start working on the first one, I take the other one out to defrost. Once the dough has softened up a little, preheat your oven to 400 degrees. Cover your baking sheets with parchment paper for easy clean up. Gently unfold the pastry sheet so it is completely flat on your counter. Then fold in the longer sides up halfway towards the center. Fold in halfway once again towards the center. Using a sharp knife, slice the dough into about 1″ slices. Place them with one of the sliced sides up on your prepared baking sheet. Place them about 2″ apart. Bake them at 400 degrees for 16-18 minutes. While they are baking, make the glaze. This way it will be ready for when the pastry hearts are done. It is best to frost the heart pastries while warm and right out of the oven. 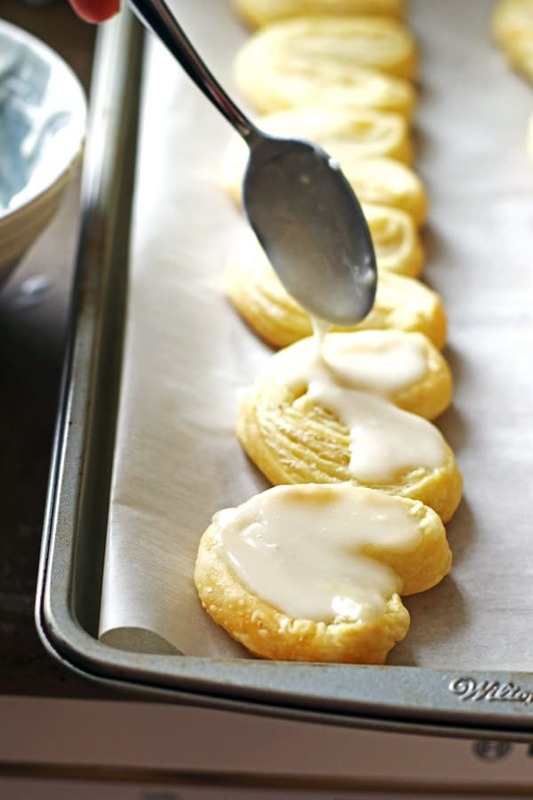 As soon as they come out of the oven, use a spoon and spread the glaze over each pastry heart. Leave them on the baking sheet until the glaze sets. Melt the butter and then add the powdered sugar and milk. Whisk together until well blended. If you prefer a thicker glaze, add more powdered sugar by adding one tablespoon at a time until you have the consistency you like. 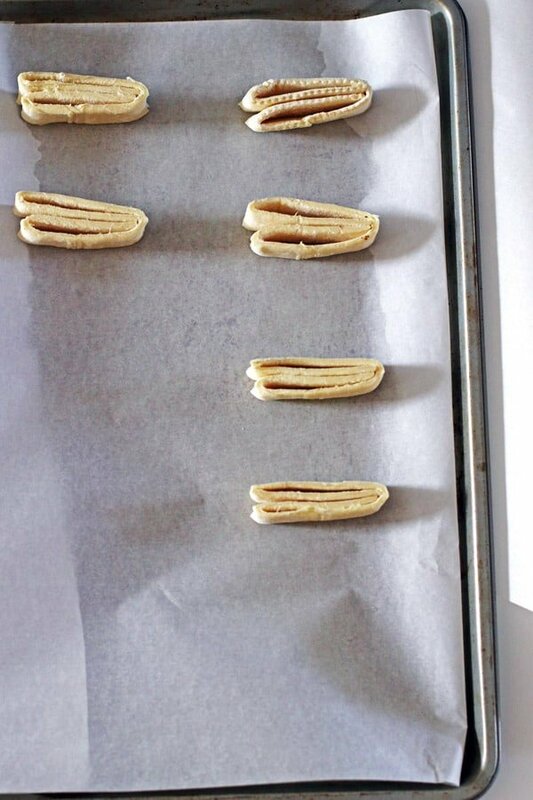 Gently unfold the pastry sheet so it is completely flat on your counter. Make the cinnamon sugar mixture by combining 2 tablespoons sugar and 1 ½ teaspoons ground cinnamon in a small bowl. Pour some water in a small bowl. Lightly add a little water to the pastry dough. Generously sprinkle the cinnamon mixture over the pastry. Then fold in the longer sides up halfway towards the center. Dab slightly with water and sprinkle the cinnamon mixture again. While they are baking, make the glaze. This way it is ready for when they are done baking. It is best to put the glaze on while they are warm. 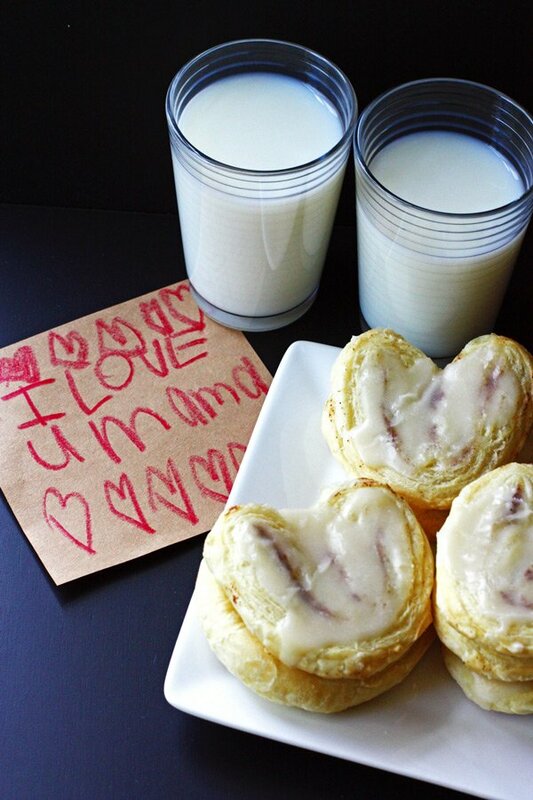 Using a spoon, spread out the glaze evenly over each pastry heart. Let them sit on your baking sheet until the glaze sets. And yes, you will probably be tempted to try one right out of the oven! If you prefer a thicker glaze, then just add more powdered sugar adding one tablespoon at a time until you have the consistency you like. You can find the puff pastry dough in the freezer section, usually with the pie crusts. For easy clean up, I usually use these Artisan Silicone Baking Mats or parchment paper to cover my baking sheets for easy clean up. If the pastry tears a little when you are handling it, just dab a little water on it and press it back together. To make the cinnamon sugar mixture, combine 2 tablespoons sugar and 1 1/2 teaspoons ground cinnamon in a small bowl. You might have a little extra mixture depending on how much you sprinkle on the pastry. If so, you can save it for another time down the road. Maybe to sprinkle over chocolate chip pancakes or french toast? 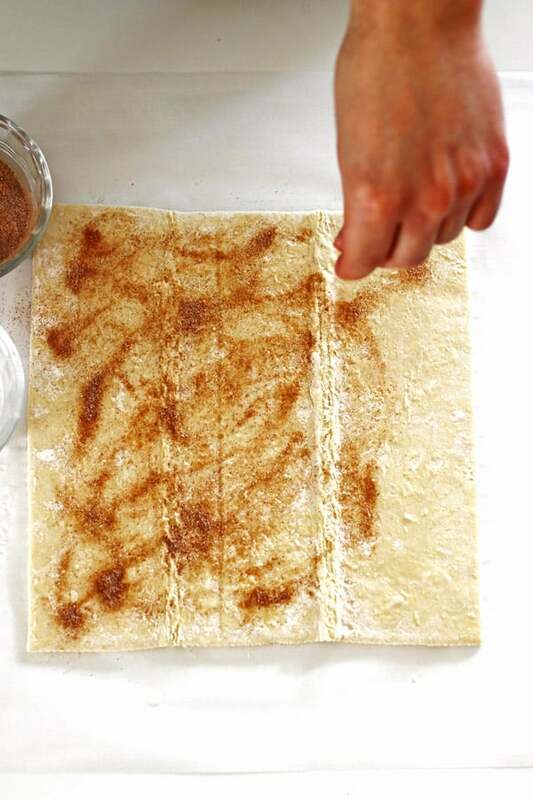 When making the puff pastry with cinnamon, just add a little water so that it is just slightly moistened. These are a great dessert to make with kids. They will love to help out and have such a yummy treat after they are done baking! 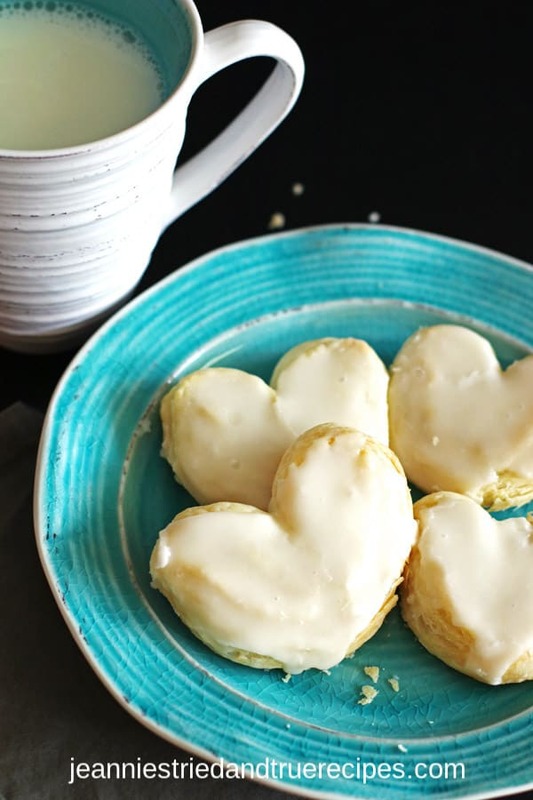 Another delicious heart shaped treat are these Sugar Cookies. They are also simple to make and a kid friendly recipe. I hope you make these and enjoy them as much as we do. They are so good right out of the oven. So good…like melt in your mouth good! Did you make these? I would love to hear from you….please comment and rate the recipe below! Thanks and have a wonderful day! 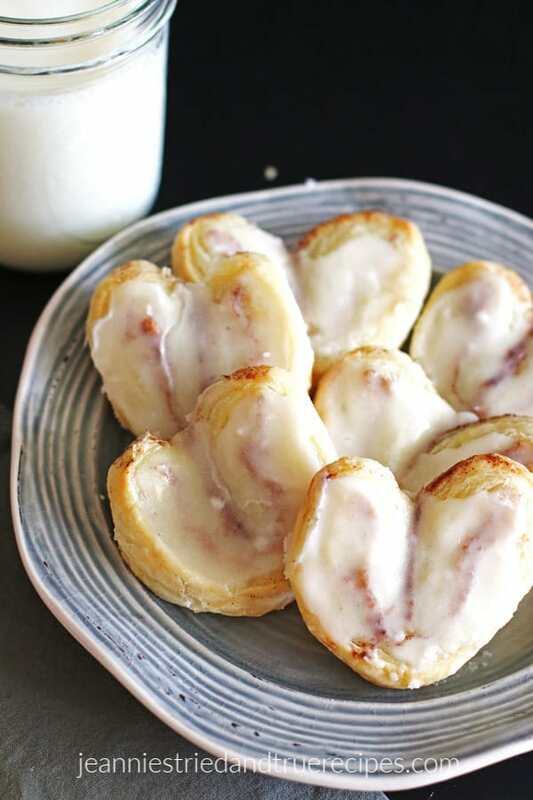 Puff Pastry Dessert in the shape of hearts are delicious and melt in your mouth. They make a great dessert and also a nice gift for someone. Place parchment paper or silicone mats on baking sheets. Fold each longer side up half way towards the center. 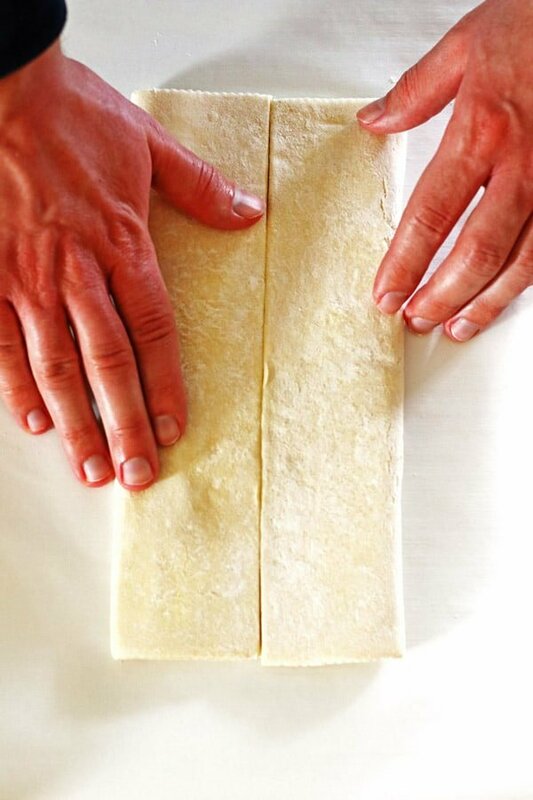 Fold in pastry in half. 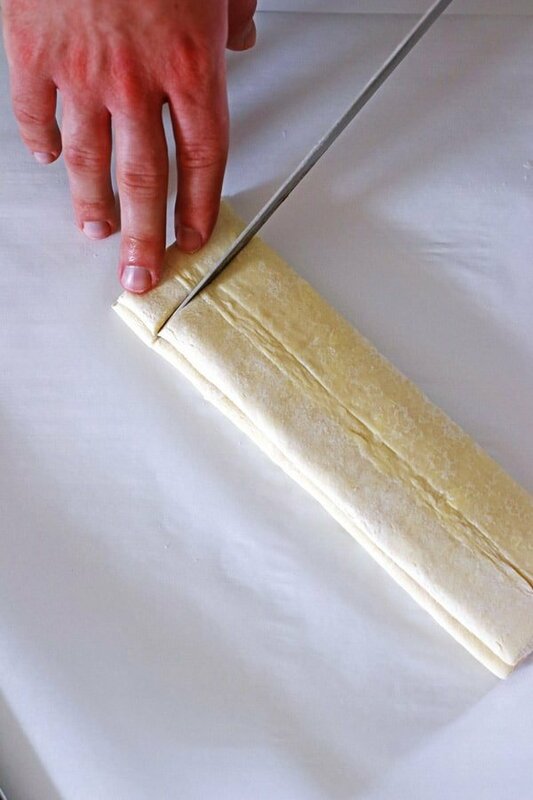 Slice the pastry in 1" slices using a sharp knife. Place them sliced side up on baking sheet about two inches apart from each other. While they are baking, make the glaze by adding the powdered sugar and milk to the melted butter. Whisk until well blended. As soon as you take the pastry hearts out of the oven, drizzle the glaze over each pastry heart and spread out evenly with a spoon. Let them sit until the the glaze has set. Store covered for two to three days. Mix together the cinnamon and sugar in small bowl. 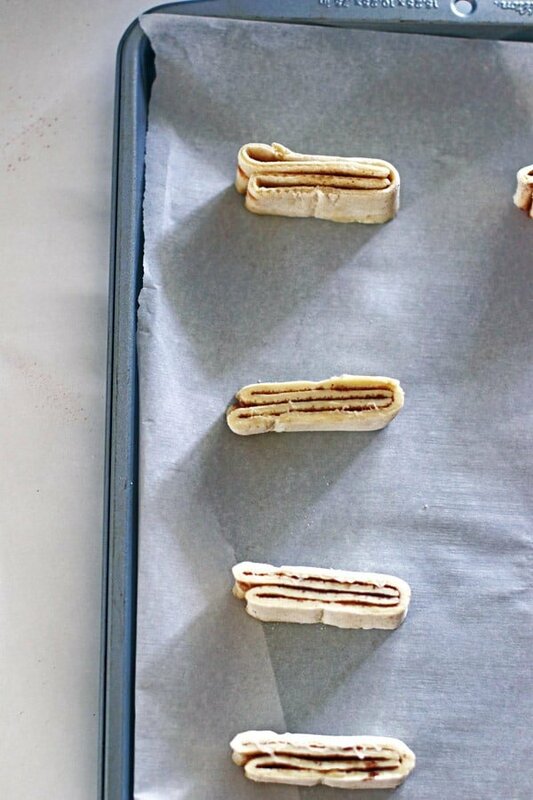 You will add the cinnamon mixture twice, once when the pastry is placed out flat and also after you fold the two sides in. Before sprinkling the cinnamon mixture on the pastry, dab with water just to moisten the pastry up a little. Follow the rest of the directions from the recipe card. For easy clean up, I usually use silicone baking mats or parchment paper to cover my baking sheets for easy clean up. To make the cinnamon sugar mixture, combine 2 tablespoons sugar and 1 1/2 teaspoons ground cinnamon in a small bowl. You might have a little extra mixture depending on how much you sprinkle on the pastry. If so, you can save it for another time down the road. Recipe makes 18-20 pastry hearts. Mmmmmm! That looks so good 😊 I want to try that😋!